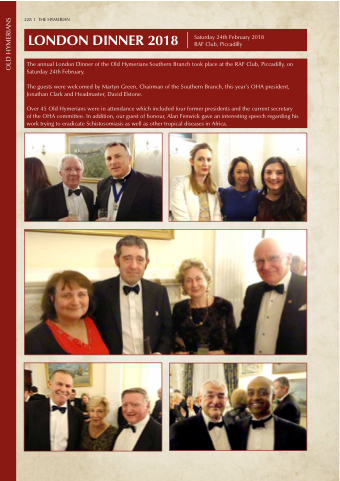 The annual London Dinner of the Old Hymerians Southern Branch took place at the RAF Club, Piccadilly, on Saturday 24th February. The guests were welcomed by Martyn Green, Chairman of the Southern Branch, this year’s OHA president, Jonathan Clark and Headmaster, David Elstone. Over 45 Old Hymerians were in attendance which included four former presidents and the current secretary of the OHA committee. In addition, our guest of honour, Alan Fenwick gave an interesting speech regarding his work trying to eradicate Schistosomiasis as well as other tropical diseases in Africa.